Scroll to the bottom to sign…anyone from ANY Seattle neighborhood can sign. Defend your city, defend your neighbors! 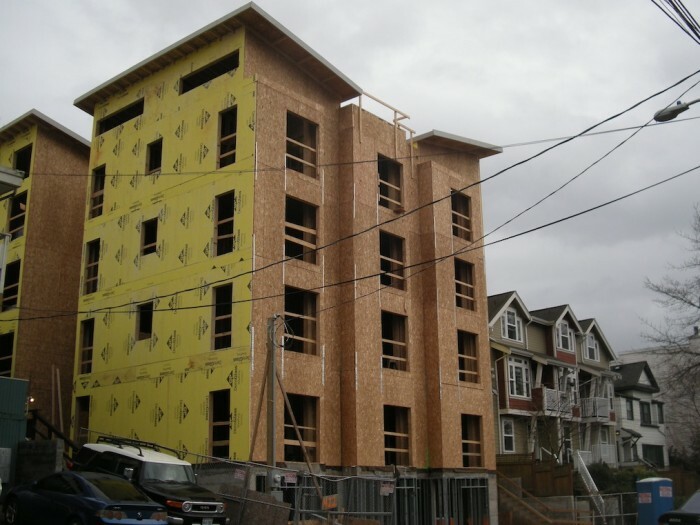 In 2010, Seattle changed its land use code to allow much larger maximum height and bulk for new construction in multi-family, lowrise, 3-story (LR3) neighborhoods in growth areas. This has incentivized a frenzy of development, leading to the proliferation of overly tall, boxy buildings that do not fit the scale or character of Seattle’s vibrant, livable, family-friendly, and historic multi-family neighborhoods. We’re losing much needed sunlight, as well as views, green space, and tree canopies. Thus, we –the residents of these LR3 neighborhoods– are proposing a simple fix to this problem that threatens to devastate our communities. All we ask for is 30 foot maximum heights and a proportional reduction in floor area ratio throughout LR3 zones. If you are a Seattle resident and want to preserve sunlight, greenspace, and the unique character of Seattle’s multifamily neighborhoods: please send a message to Seattle City Council by signing our petition! This proposed cleanup legislation is aimed at mitigating unintended consequences of 2010 changes to the Seattle land use code, which have led to the proliferation in LR3 zones of excessively tall buildings that block sunlight, reduce green space, and do not fit sensitively into established neighborhoods. The proposed fix would reduce maximum building heights and floor area ratios inside designated growth areas to levels outside growth areas, and would thereby alleviate the majority of the detrimental effects of the 2010 changes. We believe that these changes do not alter key parts of the 2010 legislation that encourage variety in housing types, and will not affect the ability of Seattle’s LR3 neighborhoods to meet current and future growth targets. From 1989 to 2010, Seattle’s lowrise residential neighborhoods were zoned either as LDT (lowrise duplex/triplex) or L1-L4. These zoning height, setback, and density limits contributed greatly to making Seattle’s lowrise neighborhoods vibrant, distinctive, and very livable. By preventing new buildings from towering over their neighbors, these limits also preserved sunlight, tree canopies, green space, and most importantly, neighborhood character. However, despite these merits, some aspects of that land use code resulted in the proliferation in L3 zones of townhouses centered around autocourts and parking spaces, with small unusable yards. Additionally, very few apartments were being built in LR3 zones. To encourage more variety in housing types and more creative designs, legislation was passed in 2010 that overhauled the lowrise zoning and converted the L3 and L4 zones into a new LR3 zone. In the new LR3 designation, floor area ratios (FAR) replaced density limits in most cases; height limits were increased; and even higher height and FAR limits were allowed in “designated growth areas”, which refer to urban villages, urban centers, and land within station area overlay districts. Additionally, alley access was increased, open space standards were replaced with residential amenity standards, landscape requirements were replaced with Green Factor requirements, and standards for location of waste and recycling bins were revised. Many aspects of the 2010 zoning changes appear to have led to desirable improvements. However, these changes have also led to some unintended consequences that have been highly detrimental to neighborhoods zoned LR3 inside designated growth areas. Specifically, in most L3 zones where apartments were previously limited to a height of 30′ (+5’ for a pitched roof), the conversion to LR3 now allows apartments as high as 40′ (+5′ for a pitched roof) if they are inside designated growth areas. Another example of unintended consequences has been the piling on of exceptions that were not intended for use in combination (i.e. 4′ height exception for a butterfly roof plus 4′ height exception for a partially below grade ground floor, thereby allowing 40′ + 4′ + 4′ in some instances). Together, the increased heights, increased FAR, and the piling on of exceptions, have led to the proliferation of buildings that far exceed the scale of neighboring homes and apartments. Such out-of-scale buildings reduce residents’ access to sunlight, reduce green space and tree canopies, and do not fit the character of these established neighborhoods, as shown in a recent example at 422 11th Ave. East in Capitol Hill. For these reasons, we propose modifications to the 2010 legislation that will reduce maximum height in LR3 zones within designated growth areas to 30′ (+5′ for any type of pitched roof) with proportional reductions in FAR; prevent the piling up of multiple exceptions; ensure that design guidelines continue to reference the existing mass and character of neighborhoods; and balance the need for density with the need to ensure that new buildings fit the character of the neighborhood. • Preserve Seattle’s tree canopy and green space, both symbolic of the livability and commitment to environmental stewardship of “the Emerald City”. Section 1. Maximum height for apartment buildings in LR3 zones before any exceptions are factored in will be 30 feet, regardless of whether the proposed buildings are inside or outside designated growth areas. Section 2: The code will no longer allow height exceptions to be combined. For example, adding the height bonus from a butterfly or shed roof to the height bonus from a below-grade floor will not be allowed. Only one of these height exceptions per building will be allowed. Section 3. Maximum floor area ratios (FAR) for LR3 inside designated growth areas will be the same level as those for LR3 outside designated growth areas (1.1 or 1.3 for townhouses; 1.3 or 1.5 for apartments; and 1.6 for apartments located on a street with frequent transit service). Thus, the lowered maximum height proposed in Section 1 will be matched to an appropriately proportioned FAR. Section 4. Any future changes to the land use code, including those linked to mass transit, will be informed by a thorough, inclusive discussion with affected residents and community members. Whenever possible, mailed notices should be sent at the outset of discussion of proposed changes to all affected property owners and residents, as was done recently in the Pike/Pine neighborhood when amendments to zoning there were proposed. Signatures are limited to Seattle residents, but you can sign if you live in ANY Seattle neighborhood and ANY zone (not just LR3). Your signature and email address will NOT be listed on a webpage. Seattle City Councilmembers and their legislative aides will receive your name and neighborhood (but not your email address), along with our petition. We will not share your email address with any other groups or individuals, and we will limit our contact with you to occasional updates on our progress. If you do not want to be on our mailing list for occasional updates, please mention that in the comment box.